MC-T04 50cc Moped Scooter with 10" Wheels, Electric/Kick Start! Rear Trunk! Great Deal! I most differently will buy again from PowersportsMax; they offer fast and friendly services. I received my Tao Tao ATM50-A1 in less than a week, (and I live all of the way in Northern Maine). I received the scooter in perfect condition with just a few scratches from shipping, for which I knew to expect when it is shipped all the way to my home from China. Got it together in less then a half of a day, and Boy does she drive nice. I have done a lot of research and shopping around and I kept coming back to PowersportsMax for the best price, products, and services. I would recommend PowersportsMax for your next scooter! nice bike and fun to ride, this is the second bike i have bought from them, i would recommend this company. This scooter is what i consider the best 50cc scooter on the market for what you pay. It is extremely reliable , great gas mileage , and i have owned my for several months now and have never ever had a problem. i was going to buy a mini bike and these scooters are just as cheap ! but built to last. i do intend to get her one... get yours , i promise you will not be disappointed.!!!! Wonder scooter. It has exceeded my expectations. It runs great, good gas mileage and very easy to assemble when delivered, in which delivery was fairly quick as well. I definitely recommend this bike to anyone who is interested in purchasing a scooter/moped. I am completely satisfied with it. I travel about 20 miles a day, and even more at times with no problems! One day I made a 60 mile round trip commute and it did wonderful. No problems whatsoever. Love it and so does my 11 year old son! the prices are just right and the custimer service was very nice. I had a lot of questions and they were very patience hhich may me to by the bike because i was afraid to get it on line. So far so good. I have had this scooter for two weeks. Assembly was easy. Really cool little scooter. Runs great. Assembly instructions are comically poor. Ordered a pink one for my wife. Definitely worth the money. I was hesitant about ordering because of mixed reviews. I'm glad I took the chance. I ordered the Pink for my wife and blue for myself. My only gripe is that the pink weren't available after i ordered so my wife had to settle for red. We got them like 3 days after ordering. Shipping was super quick. So far sense I got my scooter in the mail and put it together I love it!! !I had to adjust the idle screw but thats it!!!! Loving this scooter I've rode it a couple times so far but its nice it's only for the city though for you speed demons.Thankyou powersports!! I most differently will buy again from PowersportsMax; they offer fast and friendly services. 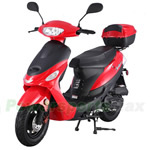 I received my Tao Tao ATM50-A1 in less than a week, (and ..
Taotao Powermax 150cc Moped Scooter with Sports Style, 12" Black Wheels, Hand Brake! Electric/Kick Start! Rear Trunk! DOT Motorcycle Open face shield Helmet Open face shield - White Helmet Free Shipping! X-PRO® Red Open Face Dual Visor Motorcycle Helmet- Red Free Shipping!